Whatever the significance of the ‘reconciliation’ between Fatah and Hamas, Hamas is not a member of the PLO. Hence it is possible for the PLO to maintain its distance from a group which is generally recognized in the West as terrorist and racist, and with which Israel and many other nations will not negotiate. Although the PLO is also a terrorist and racist organization, it has officially denied this and its denials have been (foolishly) accepted by Israel and others. The Palestinians as well as all the Arab states have always interpreted resolution 194 as calling for the ‘return’ of all Arab refugees and their descendants to ‘their original homes’ in Israel. It is important to realize that this is an inseparable part of their demand for statehood. It is one of the primary reasons — if not the primary reason that previous Israeli offers of as much as 97% of Judea/Samaria and large parts of Jerusalem were not accepted in 2000, 2001 and 2008. Other PLO officials have been even more specific, stating that ‘refugees’ in the Palestinian state will not get Palestinian citizenship. Statehood, they want to make 100% clear, will not terminate refugee status or allow for their resettlement anywhere other than Israel. The ideas of hereditary refugee status, refusal of resettlement, and a ‘right of return’ have never been accepted before in the history of refugee situations since WWII. And yet, the Arabs take this as a given. Of course this demand is nothing more than a demand to dissolve the Jewish state. these violent prisoners will be soldiers in the continued ‘resistance’ after the Palestinian state is declared. Of course, he fails to mention Gilad Shalit who is being held for ransom simply because he is an Israeli and whose conditions of imprisonment are far worse than those of the Arab murderers in Israeli jails. “Resolutions of international legitimacy” refers to the SC and GA resolutions that Abbas expects from the UN. With these in hand he is prepared to negotiate with Israel from a starting point of a ‘Palestine’ that includes all of Judea, Samaria and Gaza, with its capital in Jerusalem (“Al-Quds Al-Sharif”), and with a precondition that all “settlement activities” will end. Consistent with his mention of the Arab Initiative, I understand this as the ‘implementation phase’ — the process of the evacuation of all Jewish residents of the territories, as well as the realization of the ‘rights’ of all ‘Palestinian refugees’ to settle in Israel or receive compensation. This is all he is prepared to ‘negotiate’! It is understood that these [permanent status] negotiations shall cover remaining issues, including: Jerusalem, refugees, settlements, security arrangements, borders, relations and co-operation with other neighbours, and other issues of common interest. In other words, following resolutions 242 and 338, Israel will get “secure and recognized boundaries.” And the actual borders (etc.) will be determined by the permanent status negotiations between Israel and the PA — not the UN. So in fact the Palestinians are not adhering to previous agreements. 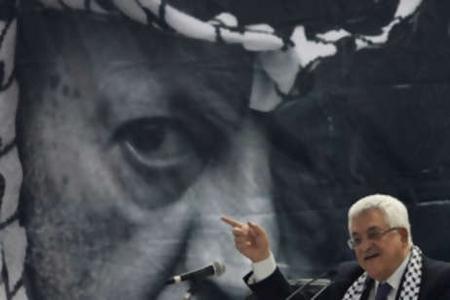 For Abbas, there is no Jewish connection to the Holy Land. And his program is a program to end the “ongoing Nakba” of 63 years: Jewish control of any of it. This entry was posted on Saturday, September 24th, 2011 at 10:33 am and is filed under General. You can follow any responses to this entry through the RSS 2.0 feed. Both comments and pings are currently closed. Abu Bluff did not mention anywhere in his UN speech recognition of the age old connection of the Jewish people with Eretz Israel. This is quite intentional as is the omission of any mention the Jewish people are also entitled to national self determination. The Palestinian program then is not about seeking peace with Israel. It is not about co-existence within the framework of a two state solution. To the contrary, it is program to wipe Israel off the map of the Middle East altogether. People continue to remain in denial about the truth. But in abrogating Oslo and terminating the peace process, the Palestinians have made their aim crystal clear. The conflict will go on and no peace is going to be attained for a long time to come. I agree with the analysis given here but I would point one perhaps positive element. He does not, as I understand it, threaten to return to the armed struggle. The tacit security cooperation between the PLO and Israel to prevent terror against Israeli citizens may well continue. Why is this important if behind it there is nonetheless the Palestinian goal of destroying the Jewish state? Very simply, the saving of lives is important. Abbas of course does not bind ‘Hamas’ and no doubt there will be violence from that direction.